Know what? I really hate the way I vacillate. She loves me. She loves me not. I guess I could look on the bright side. They say that if you're gonna be wishy-washy, you might as well be consistent about it. Well, if that's the case, I'll make the All-star team with ease! Today's oeuvre proves [couldn't resist that lovely bit of assonance] that I'm an inveterate vacillator [nor that aliquot of alliteration]. From the reader's perspective I must look like the substance-abuser who can't get that next fix off his mind. I wish I didn't have to. I wish they'd just listen! 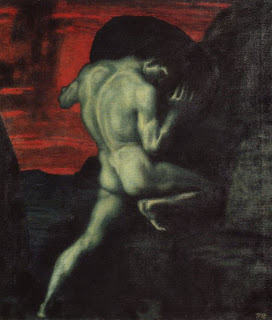 Sisyphus, give me all your strength! And now, downward to the past...like any good archaeologist. 'Grave shortcomings: the evidence for Neandertal burial,' [my BA Honors essay] was published in 1989. One of the first major publications that mentioned my then-recent work was 'In the Eye of the beholder: Mousterian and Natufian burials in the Levant' by Anna Belfer-Cohen and Erella Hovers (Current Anthropology 33, 463-471, 1992). Their paper tries to make the case that if one applied the same stringent criteria as that scallywag Gargett does for recognizing purposeful burial in the Middle Palaeolithic, even perfectly good modern human burials wouldn't pass muster. They're right. But that doesn't change a thing. A fact's a fact [as long as your premises are well-warranted, which theirs arent']. My purpose in writing today is two-fold. I hope to demonstrate just how the authors and everyone else [including Paul Pettitt] were happy to accept the [largely] argumentum ad hominem criticisms published along with 'Grave shortcomings,' and to carry on as if [and in all likelihood] they had never seen my dispositive responses to all of my ur-detractors. After that, I want to tell you what I [still] think of their argument. And all because of that pesky Paul Pettitt. I need to do this to get you ready for what I want to say about his book [which is where the whole vacillation thing comes in]. In early 1991 Adam Kuper sent me a draft of the Belfer-Cohen and Hovers paper 'for [my] assessment.' At the time he was the editor of Current Anthropology [and there was no doubt in my mind that he would have had a sly smile on his face as he penned his signature on that letter]. I mention this now because I think it would be valuable, finally, for someone other than Kuper, Belfer-Cohen and Hovers to see my remarks. For those of you who've never encountered 'In the eye of the beholder' you need only visit academia.edu and view or download the University of Chicago Press e-document by clicking here. I urge you to have a look. It shouldn't take long to read. And I think it's an exemplum of the programmatic ignorance of my work at that time. I'm put in a difficult position reviewing this paper. Unless I recommend publication (which I don't), the authors will view my comments as prejudiced—both because of what they argue is my bias toward the extant species of the genus Homo, and because I've been vocal in my criticisms of previous attempts to argue for burial in the Middle Paleolithic (specifically among Neanderthals). But comment I must, and I hope that I don't come off sounding shrill. At the outset, let me say that I think this kind of comparative study is required. Belfer-Cohen and Hovers have demonstrated, quite convincingly, that the criteria often employed by Middle Paleolithic specialists when assessing the question of burial are not germane. I should note that, although they don't restate the criteria I advanced, there are some fairly rigid guidelines in my 1989 CA paper that replace the questionable linkages between behaviour and archaeological remnants so prevalent in the literature (and, I might add, which the authors choose to perpetuate), such as flexion, articulation, so-called grave offerings, and so on. I'm speaking of the necessity of finding a clearly defined new stratum created at the time of burial. If, as Belfer-Cohen and Hovers argue, traditional criteria do nothing to support the archaeological inference of burial among modem populations, what possible use can they be in recognizing perhaps the first instances of burial among other hominid taxa? This is a point I've made before. I may as well be straightforward on another subject: I have trouble with much of the argument in this article, because there is no explicit treatment of my 1989 paper. The authors merely stale that "[Gargett's] view has been widely rejected on several grounds." This is not followed by a single reference to a published refutation of my work. I find this to be perhaps the greatest obstacle to their argument. In rejecting, out of hand, my thesis regarding the "burial" of Neandertals, they treat the 1989 paper as a monolith. Thus, my arguments dismantling the laughable inferences of ritual goat horns at Teshik-Tash, for example, are lumped together with my (according to them "unconvincing") arguments about purposeful burial there and elsewhere. As a result, their analysis perpetuates what are very likely myths about Neandertal behavior. Any archaeologist today should look at the Teshik-Tash material and recognize it for what it is, i.e. not a circle of horns placed points down in the sediments surrounding the alleged burial. Yet later, when Belfer-Cohen and Hovers discuss similarities between the Neandertal "burials" and those among the Natufians, they refer to "Certain spatial arrangements," including the case "known from outside the Levant, ... where the skeleton of a child was surrounded by a ring of 5-6 pairs of horn cores of Capra siberica." I could raise equally damaging questions regarding each and every one of the proposed similarities between the MP and UP situations, but that would take far too long. I hope that this example suffices to make my point. By using such questionable "spatial arrangements" in their analysis, the two classes of material (one from the Middle Paleolithic and one from the Upper Paleolithic) are said to appear similar. Yet, I've argued that they're not comparable, and, whether or not I'm right in this, the authors don't dealt with my arguments in any meaningful way. Rather than labelling us intellectual bigots, perhaps Belfer-Cohen, Hovers and others should examine the implicit beliefs and motivations that lead them to accept very tenuous arguments for what are called symbolic or ritual behaviors on the part of Neanderthals and other Middle Paleolithic hominids. 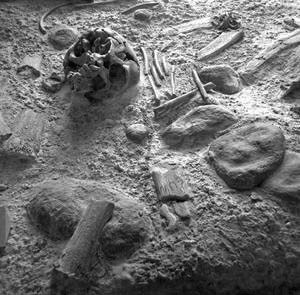 Moreover, when they treat a portion of reindeer backbone or pig manidible as grave offerings, isn't it just a little patronizing, if not paternalistic, to suggest that "the mundane 'grave goods' associated with Middle Paleolithic skeletal remains may reflect the simplicity of the material culture and of the social organization." Is not this tantamount to saying that there's a direct relationship between the presence/absence of 'grave goods,' their 'sophistication,' and the degree of cultural ability? Since this is something that Belfer-Cohen and Hovers would argue against, I find it interesting that they would introduce such a notion at this point in their argument. A pig mandible, if it were in fact shown to be an object placed with a purposely buried individual (and could be demonstrated to have had some symbolic meaning to that hominid, which would be difficult to argue from the archaeological evidence), should not be looked down upon as 'mundane' (or that it represented an incipient kind of symbolic behavior) simply because it does not conform to the investigator's (culturally bound) ideas of what constitutes 'sophisticated' funerary offerings. I would add that the enigmatic structures mentioned in their paper, such as "talking tubes" or "eternal flames" associated with Natufian burials, do not carry such inherent meanings—these are constructions of their excavators and are not self-evident. I'm struck by the ease with which Belfer-Cohen, Hovers and others accept such inferences and speculation as a reasonable construal of the archaeological remains. When the authors say that "mental templates as to what a burial should look like ... are projected onto the past, regardless of contextual background," it's to all my predecessors,' and not to my arguments, that they must be referring. It was to just those contextual backgrounds that I was turning in my 1989 paper, while every other worker has relied on culturally bound assumptions about what burial should look like (including such things as degree of flexion, presence of grave goods, or the presence of a grave). In this regard, Belfer-Cohen and Hovers do not escape criticism. I haven't been convinced by their argument about a prejudice on the part of workers like me who seek a better understanding of the behavior of Middle Paleolithic hominids. I strongly suggest that it's their own belief about the humanity of Neandertals and other Middle Paleolithic hominids that leads them to accept questionable evidence about a whole range of behaviors that simply haven't been adequately demonstrated. I'd add that, while there's a necessity to document and compare mortuary treatment in the Late Pleistocene and Holocene with that alleged for the earlier period, I don't find the authors' approach thorough or rigorous. I reiterate that I think it's a mistake to discount my arguments out of hand. And it's equally misguided to repeat the inferences of those who quite obviously carry the same bias as Belfer-Cohen and Hovers. Calling three large stones and a rhinoceros tooth a "spatial arrangement" associated with the Kebara infant seems to me to underline what I said above about the paternalistic and inherently biased viewpoint of 'the other side.' Another example: employing Smirnov's arguments is suspect, because he not only accepts (again uncritically) all the earlier inferences of ritual and burial, but he also adds some new ones of his own ("hearths underlying" hominid skeletal material seen as some kind of ritual architecture). That Belfer-Cohen and Hovers refer to secondary and tertiary "evidence" (such as the work of Smirnov) in the construction of their argument, and prefer to ignore the original reports upon which my argument was based is a very big omission. They prefer to rest their out-of-hand rejection of my thesis on some comments of questionable value following my article in CA (none of which were refereed, and all of which were disposed of in my reply). The authors have also failed to cite my later comments (CA 30:326-329) which amplify and further clarify my argument. Indeed, in employing the inferences of Okladnikov regarding the Teshik-Tash goat horns, I have to wonder if they have even read my paper. My "opinion" about Neanderthals notwithstanding, these authors have simply failed to provide any new "evidence" for the purposeful burial of any Middle Paleolithic hominids. And, though it was not their intention, their argument is all than much weaker for this lacuna. Classifying, as they do, material alleged to be associated with Middle Paleolithic hominids as "grave goods" or "grave structures," and to include them in a comparison with material similarly classified from the later period, is methodologically unsound, at best. Moreover, they have not provided any convincing "evidence" that those who choose to question inferences of modern behavior among Middle Paleolithic hominids are any more biased than are the authors in the opposite direction. It's probably easy to see that this paper frustrates me. I hope I've managed to achieve a degree of objectivity in my comments. Anna and I have had this conversation before. I don't wish my review to be seen as a personal attack, which it most definitely is not. There are real problems with their presentation of "data" and with the sociopolitical context of their work. Their study represents another recitation of inferences that I've rightly called into question, and so far no one has adequately refuted my arguments. In sum, I'd recommend that Current Anthropology reject this paper in its present form. Perhaps if the authors could mount a credible refutation of my 1989 arguments, and manifest a little self-reflexivity of their own rather than simply accusing others of implicit bias, this paper might stand on its own—especially if it could be argued that both sides owe their inferences to their biases (which I'm not sure is possible). As it is, it wouldn't be suitable for the reports section of CA, either, unless the Middle Paleolithic "data" are left out along with the argument about bias. The perceived lack of regularity in Natufian burials is interesting in itself. But as a contrast to inferred behavior in the Middle Paleolithic, it loses power. At least until further notice, we may be comparing apples and oranges. If the editor chooses to publish this article in the form it now takes, it should indeed be accompanied by comments, and I'd like to have the opportunity to voice my criticisms (especially since I seem to be one of only a few misguided individuals who adopt a "non-human until proven human" stance in this debate). Now the 2012 Gargett'll fess up. I'm blurting this now because Paul Pettitt refers to this article by Belfer-Cohen and Hovers when he begins his wrestling match with my work.